Recordings made by a Srebrenica man called Velid Delic, who was killed in the 1995 massacres, show life in the town during the war years – with poignant messages from people who never survived. “Hello Eda, Adin, Belma, we love you all. We miss you a lot,” says a man holding a baby, waving at the camera. “Eki, send us some [German] marks, man,” two friends shout towards the lens jokingly. “Greetings to anyone who might see us,” a middle-aged woman says. She is about to continue the sentence, but stops to wipe tears from her face. “I think this tape will make it to Denmark and Germany, through our friends, the Swedes… so our people see this over there. This will, I am convinced, go around the world,” the man holding the camera tells her. The cameraman was Velid Delic from Srebrenica, who died in 1995. His remains have never been found. Delic liked to film, and would find ways to send the taped messages to the faraway lands where his relatives and neighbours had gone to escape the 1992-95 Bosnian war. He recorded the besieged town of Srebrenica from 1992 until Bosnian Serb forces, led by war crimes defendant Ratko Mladic, marched in on July 11, 1995. The townsfolk flocked to the nearby UN peacekeepers base to seek protection from the Dutch ‘blue helmets’ – who helplessly watched as Mladic’s troops separated men from women for execution. The slaughter, which international courts ruled was an act of genocide, took the lives of some 8,000 Bosniak men and boys, whose remains were then hidden in numerous mass graves in the area. Forensic experts keep finding the mixed-up bones and identifying the victims through DNA analysis so they can get a decent burial at a memorial centre in Potocari, near Srebrenica, every year on July 11. This year, 70 newly-identified victims will join the thousands already buried, but again, Velid Delic, and his father Suljo, will not be among them. On them are the last words of many Bosniaks who fled Srebrenica only to meet their deaths in the days afterwards. “Those tapes were everything to us,” Delic’s sister Nermina Lakota, who was a refugee in Germany at the time, told BIRN. The tapes also show everyday life in Srebrenica in the period leading up to the worst atrocity Europe had seen since World War II. Years later, renowned Sarajevo film-maker Haris Prolic compiled inserts from them into a documentary entitled ‘The Srebrenica Cenotaph – Velid’s Final Tape’. Velid Delic and his sister worked at a local factory when Bosnian Serb forces first laid siege to the town of Srebrenica in 1992. “Me and my other brother Reuf had families when the war started, we had small children. Velid and my father said we should go and take the children away, because we did not know what was happening,” Lakota recalled. She first found refuge in Slovenia, while her brother at first stayed with a friend in Serbia “until it became too dangerous for him to remain there”. Lakota would later go to Germany, while her brother ended up in Denmark. Velid Delic had never married, and decided to stay with his parents in Srebrenica. “I don’t know how he got the camera, but I think one of those foreigners, maybe journalists, or maybe members of UNPROFOR [the United Nations Protection Force], gave it to him,” Lakota said. Delic would send the tapes abroad via members of UNPROFOR whose tours of duty had ended. “We are all at home and are fine and healthy. Father, mother and me. 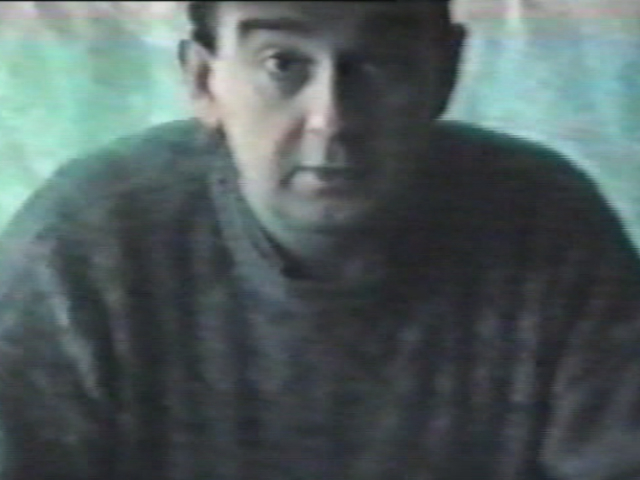 We love you a lot, and send you our greetings,” Delic says to the camera on a grainy recording dated February 14, 1994. “It is difficult to me to speak about Velid,” Lakota said in a shaky voice. She paused, let out a sigh, and continued. “He was a large man. He was very capable, talented at everything he would try. He was posthumously awarded a gold police badge for courage,” she said. Judging from the footage he shot, Delic seems to have been quite popular in the town. A recording dated December 15, 1993 shows locals greeting him and exchanging jokes with him on the street. In another scene, he films a hand-made water-wheel electric generator that a few neighbours had put together from scrap to produce electricity, which was cut off in the town for most of the war. “Film me, film me,” shout a group of small boys with excitement at the man with the camera, as they play among the ruins of Srebrenica’s streets. The footage also shows Delic joking around with his best friend, local shoemaker Salih Mustafic. Mustafic’s body has also never been found. In another recording, dated January 6, 1994, Delic sits with his mother Semka and father Suljo, drinking coffee. “Mirsada, Nermina, Selmo, come on, let’s have coffee together,” Semka Delic says. “Let them see that we are having coffee. Let them see we are fine and healthy,” Suljo Delic says. His remains are also still missing. Lakota and her family lived in the small German town of Kreuztal. She tried to send aid packages to Srebrenica through the Red Cross, but never could. The besieging forces would only let UN convoys in, and even then only after lengthy negotiations. “In the recordings, they would always say they are fine, probably to comfort us,” Lakota said. Lakota had a telephone, and many other Bosnians living close to her in Germany would use it to talk to their loved ones whenever possible. One day, her best man called her from a satellite phone she believes he was given by one of the UNPROFOR soldiers in Srebrenica. “He said there was a meeting of locals at the post office, where they decided they will not leave Srebrenica, that they would defend it,” she recalled. “The next day, Srebrenica fell,” she said. There was no contact anymore. Lakota tried calling whoever she could. “Then my husband called the wife of our best man who was in Zagreb, and she said, ‘Why are you calling now, when everyone has been slaughtered?’ I fell unconscious right away. A doctor had to be called,” Lakota remembered. How exactly Velid Delic died also remains unclear. “There are many stories about his death; which one is true, I don’t know,” she said. But one story she heard from a man who said he was present when it happened seems most likely to be genuine. To escape the slaughter, some 15,000 men from Srebrenica started walking through the woods towards, seeking safety in the town of Tuzla, which was controlled by Bosniak-led forces. Along the way, Bosnian Serb soldiers, sometimes dressed in UN uniforms they stole from the Dutch, along with their vehicles, would hunt them down and kill them. The man claimed that on August 8, Bosnian Serb forces surrounded his and Delic’s group of fleeing men while they rested in the woods. Human bones found at the place he described were collected by experts in 1997. Lakota went to test her DNA against the remains, but there was no match for her brother. Like many others, she is still hoping her brother’s and father’s bones will be found one day, and she too will have a grave to go to and mourn. Families of Srebrenica victims whose remains have not yet been found envy those families who have found their loved ones. They can look at the tapes and see their sons, fathers and brothers talking and laughing, but they cannot go and visit their graves, unlike the family of another man from Srebrenica who appears in Delic’s recordings, Asim Tepic. “I really hope for a better future,” Tepic declares on one of tapes. His remains were buried in 2000.